Ofcom are about to get involved in the complexities of phone calls to those annoying non-geographic numbers. For years there has been confusion over costs – mostly because when the 087 and 084 numbers were launched most households were BT customers. However, things have changed. Now there are a multitude of suppliers of telephone services, not to mention mobile phone networks, the days of standard national and local call rates are long gone. Providers offer ‘all-in’ packages, free minutes, off-peak, weekend, family and friends and other deals – but, even though 087 and 084 numbers are supposed to simply equate to a national or local call, they seem to fall outside most deals. Confused consumers moaned a lot and there’s even a website www.saynoto0870.com where militant consumers are rebelling against what they consider to be unfair charges. So – another non-geographic number was issued 03 – and this was supposed to be included in all the package deals. Unfortunately, not very many people have made the move from 087 and 084 numbers so the problem has not gone away. 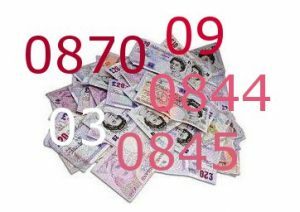 Most people know about the 09 numbers which tend to be competition lines with ‘small print’ stating what the call costs and indicates it is likely to be much more than standard charges. Most people also know that 0800 numbers are free – but not from mobiles and they sometimes don’t work at all from a mobile phone (have you ever tried calling your car rescue service from your mobile? It can be a nightmare). 0500 number are also free – but not BT numbers. Are you completely confused yet? No wonder Ofcom are getting ready to sort things out. Investigation is in progress, but they haven’t announced how this will be regulated. Watch this space!